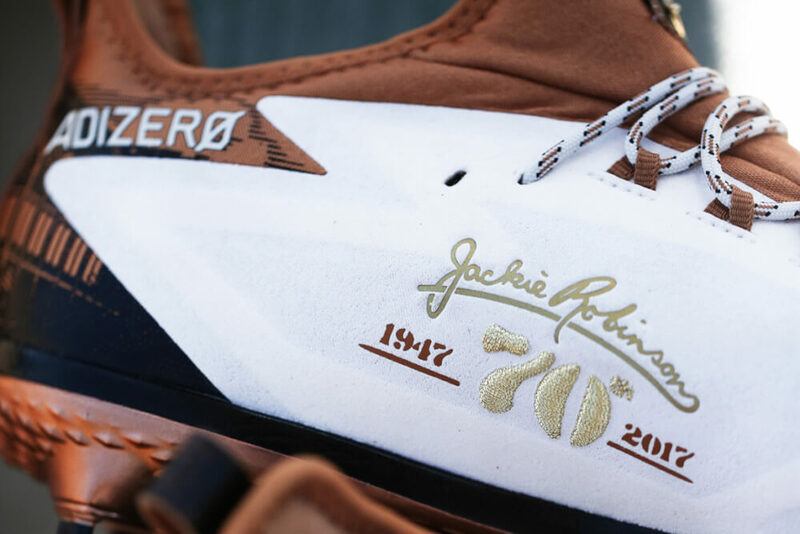 Continuing with one of WPW’s favorite traditions, here’s our first look at the 2017 Jackie Robinson Day Collection. 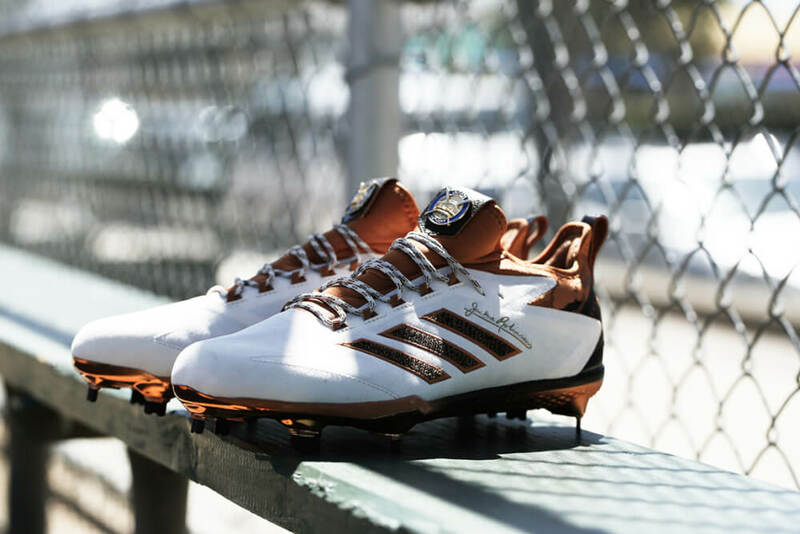 Adidas chose the Afterburner 4.0 and Icon Turf Trainer duo to celebrate Jackie’s breaking of the color barrier. The pair stir up the pot a bit, going with a previously unexplored color scheme seldom seen in footwear. The Afterburner stands out from the previous entries in its cream and burnt orange hues. A short-hair, cream suede handles the upper with details sprinkled throughout. 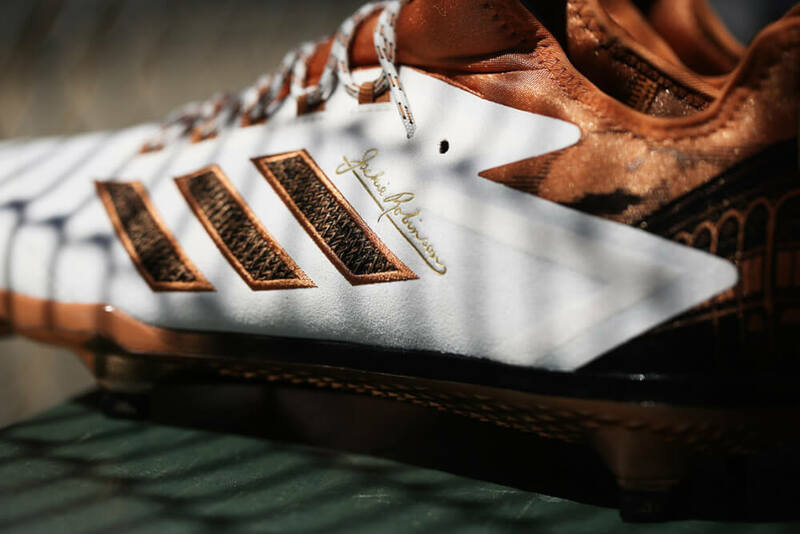 Jackie Robinson’s signature perches on the Three Stripes and the medial arch. 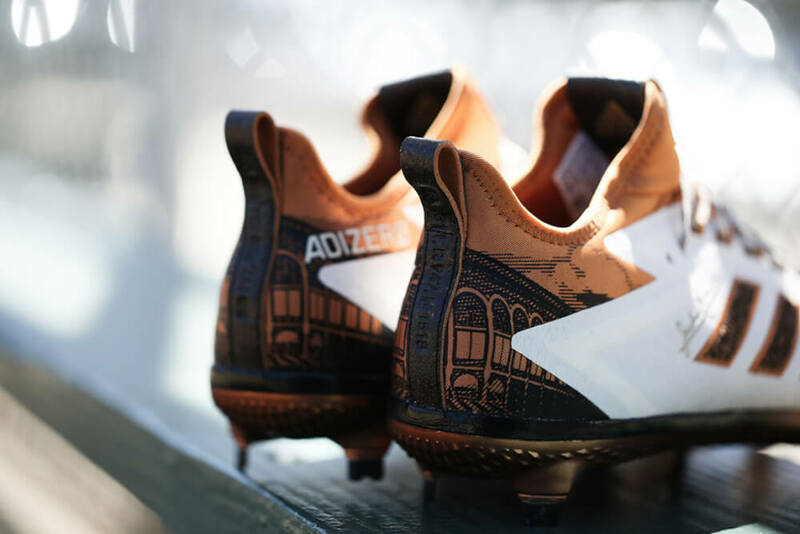 A majestic engraved print of Ebbets Field shrouds the burnt orange heel, which is braced by a leather pull tab. Jackie Robinson’s career statistics are engraved on the pull tab. The Adidas Icon Turf Trainer is a newer turf model built on the Speed Trainer 3’s platform. Opting for a more subdued aesthetic, the Icon Trainer tries on a suit of tweed and leather inspired by materials of years past. Although less provocative than the Afterburner, the quality of the materials here is apparent in the soft tumbled texture of the leather. One of the more intriguing details on this pair is a molded rubber heel clip parroting the print of Ebbets Field on the Afterburner’s heel. Both pairs feature identical sock liners (insoles) with Jackie Robinson’s signature at the heel. 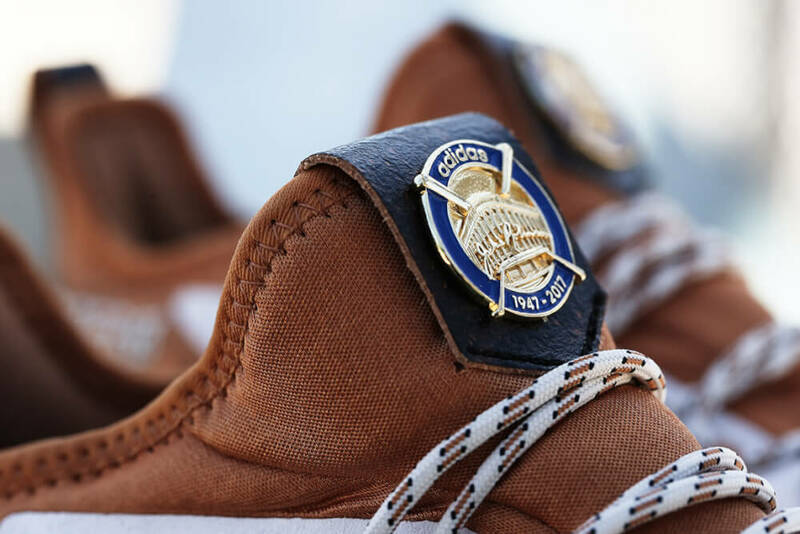 Each pair also comes with pins modeled after the 1947 World Series Press Pins, modified with Adidas branding of course. The Afterburner will be priced at $120 and the Icon Trainer will be $100 and both will be available on 4/14. Sports have always acted as a miniature model of society. Starting with the 1869 Cincinnati Red Stockings through to the 1946 16-team MLB, the highest baseball league was segregated, following in lock step with society. Beginning in 1947, when Jackie Robinson broke the color barrier, baseball began its integration while off the field, America’s civil rights revolution begin. Like the long and rocky road of desegregation in America, so was MLB’s own full integration. Pumpsie Green signed with the Boston Red Sox to integrate the last of the original 16 teams in 1959, three years after Jackie Robinson retired. Last fall we saw Fox debut Pitch, starring Kylie Bunbury as Ginny Baker. The show imagines the shattering of the gender barrier in baseball. In real life, the Sonoma Stompers, an Indy-League team, signed Kelsie Whitmore and Stacy Piagno in 2016 to further the cause. Someday, just like Jackie did for the color barrier, we will see the gender barrier broken. Imagine those customs! 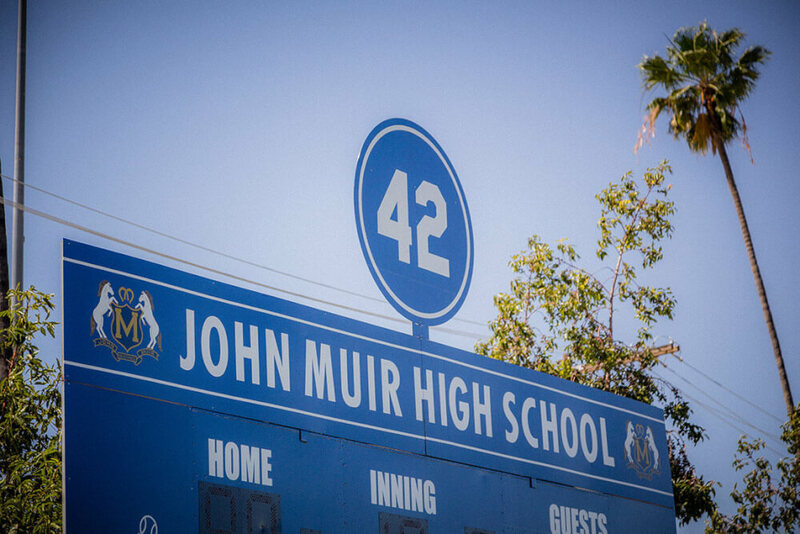 Adidas looks to the future too in celebration of this year’s Jackie Robinson Day with construction of a new baseball and softball field for Jackie Robinson’s high school, John Muir High School. “He showed us what breaking barriers looks like. We believe that through sport, we have the power to change lives and we want to help positively impact lives by removing barriers to sports for kids who might not have an opportunity to play otherwise.” said Tauna Dean, director of adidas Social Purpose. I'm a student attending UW-Whitewater to study mathematics. I've been enamored with baseball since I was 10 and have grown a strong affinity for sabermetrics and the gear of the game. Outfielder turned catcher, so I've been all over the diamond. As a "sneakerhead", I specialize in footwear and look to help all of our readers better understand what's on their feet.